MissionDrivingSchool.com is an approved online Drivers Education provider. Students of this drivers ed course learn the skills, knowledge, and attitudes needed for greater safety both as a driver of an automobile and as a pedestrian. Using the knowledge, skills, and attitudes leaned in driver education lowers chances of being involved in costly, injurious, and sometimes deadly accidents. Our drivers ed online course has been designed and developed by educational experts and approved by the State of California. It will fulfill your California DMV Driver's Education Requirements. Upon completion, you'll be ready for DMV learners permit test! You start and finish this drivers ed online class without waiting for any materials in the mail. When you have successfully completed the course, we will send your DMV Certificate of Completion (DL400C) the next day. Mission Driving School is licensed by California DMV for Online Driver Education. Click here to see a copy of our license. 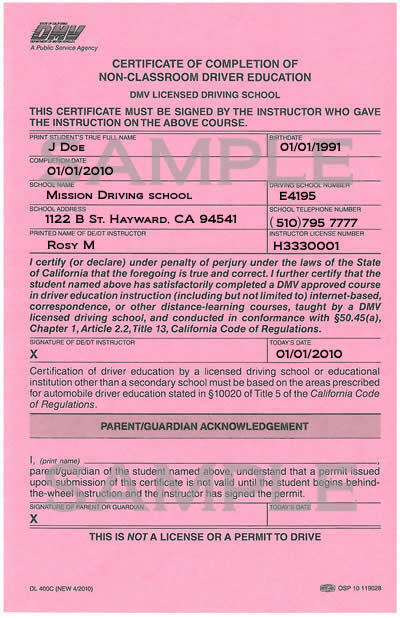 For any information/questions, please call 510-795-7777 or email: instructor@missiondrivingschool.com.